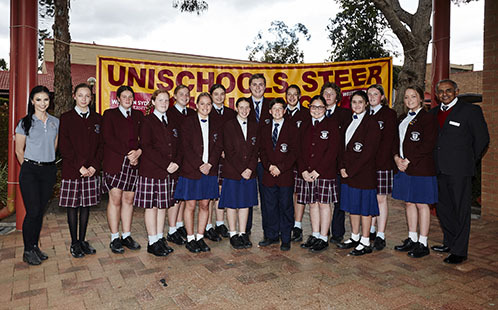 Bede Polding College has become the Champion School for the 2018 UniSchools Steer Challenge, which saw students raise a Poll Hereford steer for 3 months. The event, organised by the University, yielded great results across the 12 schools, TAFE and Western Sydney University first year students that participated, with McCarthy Catholic College and Caroline Chisholm College winning the highest number of categories. As part of the competition, the skills students had learnt from raising their steer was put to the test at the 'Live day' competition where their steers were judged in several categories, including steer weight gain, best presented steer, and many others which would ultimately determine the winner of the competition. Students were also judged in the categories of parading and herdsman. At Friday’s Closing Ceremony, Bede Polding College was announced as the overall winner for 2018, with Chevalier College and McCarthy Catholic College following close behind. In 2001, Bede Polding College was announced as the inaugural winner of the competition. Winning this year marks the sixth time the College has won the title of Champion School since the competition began 18 years ago. Adjunct Fellow with the School of Science and Health, and organiser of the competition, Stephen Blunden congratulated the hard work of the schools and all the teachers involved. 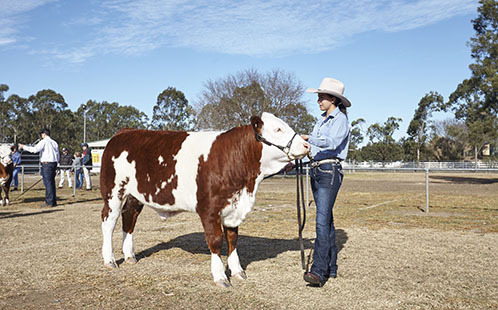 "There are unique challenges that go into raising a steer in suburban Sydney so it’s been a great effort from the students involved," says Mr Blunden.